The Caribbean island nation of St. Kitts and Nevis is home to the world’s longest running citizenship by investment program, in operation since 1984. In exchange for an investment in the country, citizens of almost any country in the world can obtain almost instant citizenship and a second passport offering visa-free travel to over 130 countries. 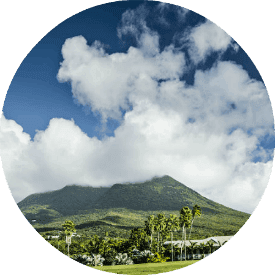 While the St. Kitts program has become more discriminating as of late, it is still an excellent option for investors who wish to obtain a new citizenship in a matter of months. How long does it take? Typically 4-6 months. Does it allow for dual citizenship? Yes, investors are permitted to retain their existing citizenships without issue. Investment Required: The minimum investment starts at $250,000 and goes up based on which investment option you choose and whether you want return of your capital. Residency Requirement: Economic citizens are not required to live or maintain a residence in the country. Antigua is a two-island nation in the West Indies. It is made up of a larger island of St. Kitts, and a smaller island of Nevis. The country is the smallest sovereign country in the Americas and as such has relied heavily on tourism and offshore services to maintain its small economy. Nevis in particular has a history of offering offshore corporate services and financial privacy. The country is considered a tax haven as it does not impose personal income tax, wealth tax, or inheritance tax. St. Kitts and Nevis has become more discriminating as to who it will accept citizenship applications from. All candidates must pass an HIV test; this includes children. At the present time, St. Kitts does not accept applications from any citizens of Iran, Iraq, or Syria. St. Kitts and Nevis has one of the 25 best passports in the world, offering visa-free access to 132 countries and territories including Europe’s borderless Schengen area. Economic citizenship may be maintained for life and passed to future descendants through citizenship by descent. There are several dozen real estate projects available for foreigners to choose from, with prices starting at $400,000 and rising into the millions of dollars. In response to the growing demand for real estate on the islands, some of these projects offer timeshares rather than full ownership for those seeking an affordable investment option. Having a second citizenship is an important step in diversifying your affairs globally, and offers the potential for better investment opportunities, tax advantages, and visa-free travel for business and leisure. If you are interested in St. Kitts and Nevis citizenship, request your free citizenship consultation below.